Welcome to Printing Services Inc. aka 2 Friends Printing, previously known as Digital Printing Services (DPS). Established in 1995 by AP Singh, Digital Printing Services has a long standing reputation as one of Kansas City's premiere digital printing companies. 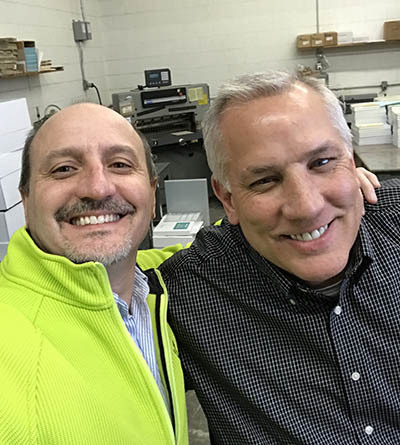 In 2016, AP retired from the industry and handed over the reins of DPS to two long time friends, Eric Amundson and Dan Riley, both with long histories in Kansas City's graphic arts and printing industries. With the transition to new management, DPS expanded it's commercial printing services to include offset and large format print services and the legal name was changed to Printing Services Inc. Internally and to our customers, the company is know more affectionately as Two Friends Printing. When Eric (Friend One) and Dan (Friend Two) are not in the office, you'll will likely find them at the farm riding dirt bikes or sketching out new ideas on a napkin at Potbelly's, their favorite place to eat. In short, we love printing, we love working with customers to find solutions to their unique needs and providing them with a quality product that exceeds their expectations. We love getting emails and posting them on our Win Board from customers that say, "You guys rock!" We would love to meet you, discuss your needs or projects, and see how Printing Services might be able to help you. Call Eric or Dan, or any of our outstanding team members at (913) 492-1500. "We enjoy helping our customer's find creative, cost effective solutions for their communication needs!"